Lovely results from eco leaf prints on water colour paper! 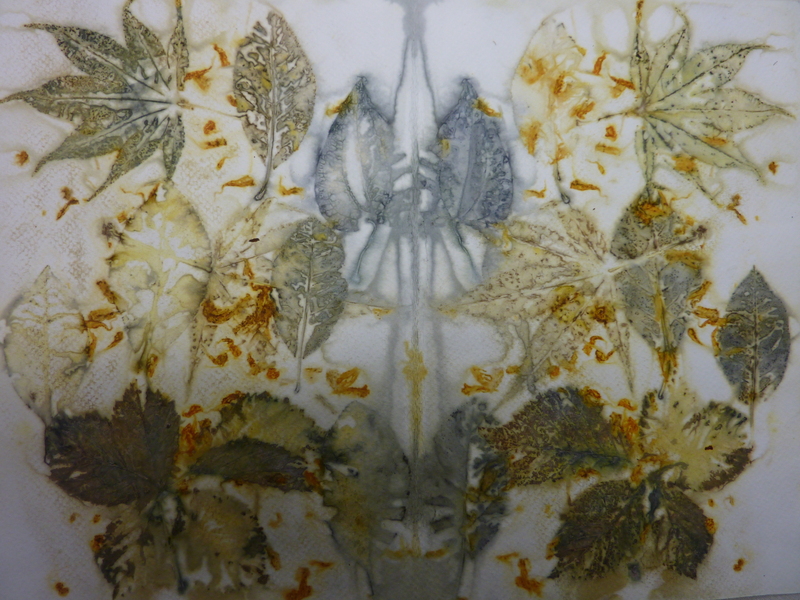 Blackberry, Cotinus Coggrygia, Chokecherry, Japanese Maple and Tagetes petals on water colour paper, folded. Amazing that the same red Chokecherry leaf prints both blue and green. I made a stack of “leaf sandwiches”. I soaked watercolour paper (from a pad) in an alum and water solution (about 10% alum) for at least a few hours. Then I laid leaves over the water colour paper, covered that layer over with a fresh piece of w-c paper, then repeated that until the pad was used up and I had a nice stack of leaf sandwiches. I laid one cardboard backing from the pad on the bottom of the stack and the other on the top. The whole stack was placed in my old aluminum turkey roaster (with three inches of water in the bottom) on a rack raised above the water level. I set three brick on top of the stack to weigh it down and placed the roaster’s cover tightly . I steamed the stack for about an hour – maybe more. I printed the following leaves in various combinations: Sweet Gum, gingko, blackberry (with vines), Japanese Maple (acer palmatum), Chokecherry (red leaves), Cotinus Coggrygia, Magnolia, Eucalyptus (Silver Dollar, Seeded Euc., Baby Blue), Alder. I gathered the leaves from the ground, not from the branches. This red Chokecherry leaf printed in many shades of green and yellow. 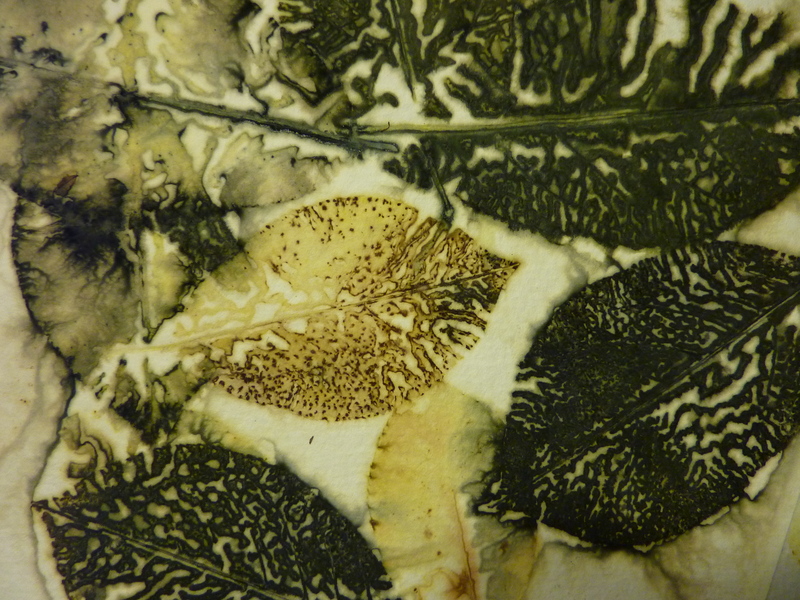 The veined side of the leaf gives the stongest colours, so by playing with the placement of leaf, veined-side-up or veined-side-down, or layering leaves over, under or beside each other, I was able to make different prints appear on the two pieces of water colour paper sandwiching the leaves. In addition, leaves exude different amounts of colour as well as different colours so frequently, one can obtain a delightful “colour wash” effect around the prints, with the wash sometimes even a different colour from the leaf print. Amazing. 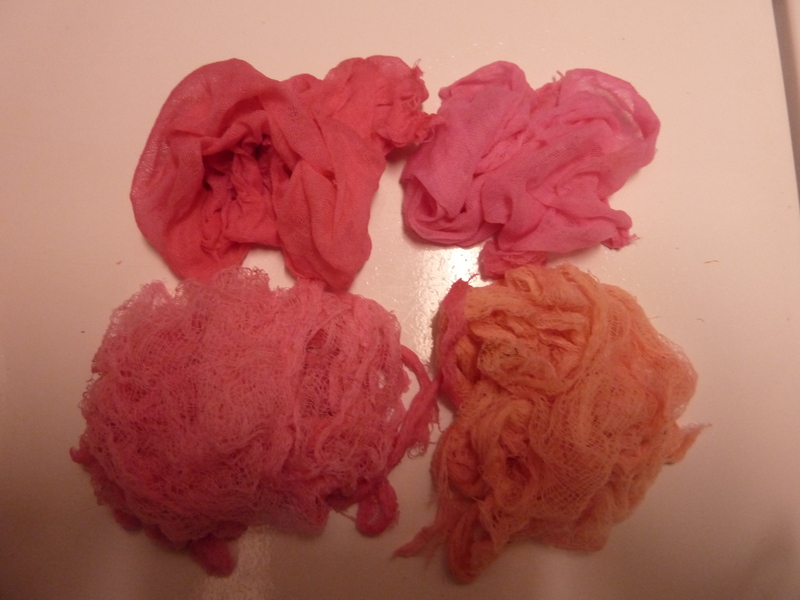 These photos were taken immediately as the papers were removed from the dyer bath. Yellows and browns predominate , with some blue-greys from the Japanese Maple. But as the time passed, colours began to change even more deliciously: greens, purples, oranges, blues, greys appeared. The darkest leaf print in this collection is from the blackberry (middle row, far left)- it is dark green, near black: But we see in the image at the top of this post that the blackberry leaf , after a few hours resting and developing, has changed colour to multiple shades of green. 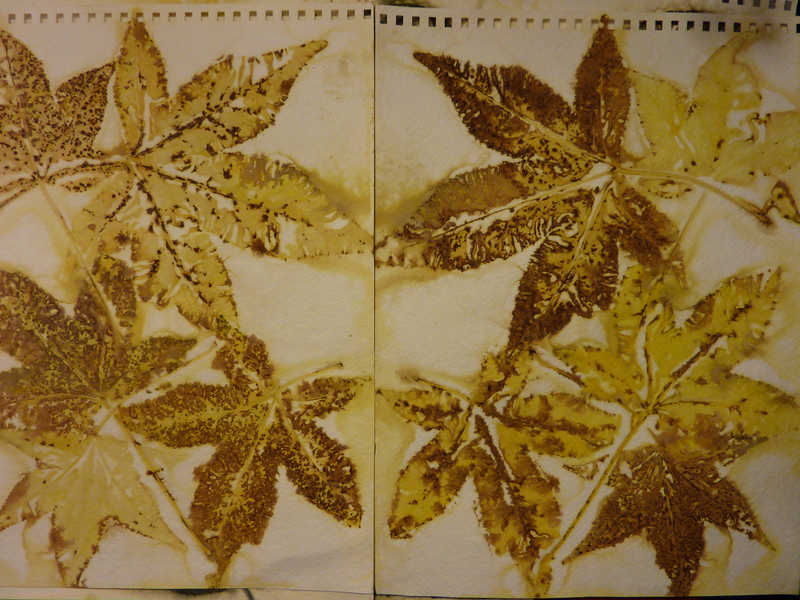 Sweet Gum leaves printed face-to-face on two sheets of watercolour paper. The variation in the colours is due to the placement of the leaves, either veined-side up or veined-side down. Most of my prints with Sweet Gum on paper have produced colours in a relatively narrow yellow-ochre-brown range but with much variation in printed textures – dots, lines, washes. 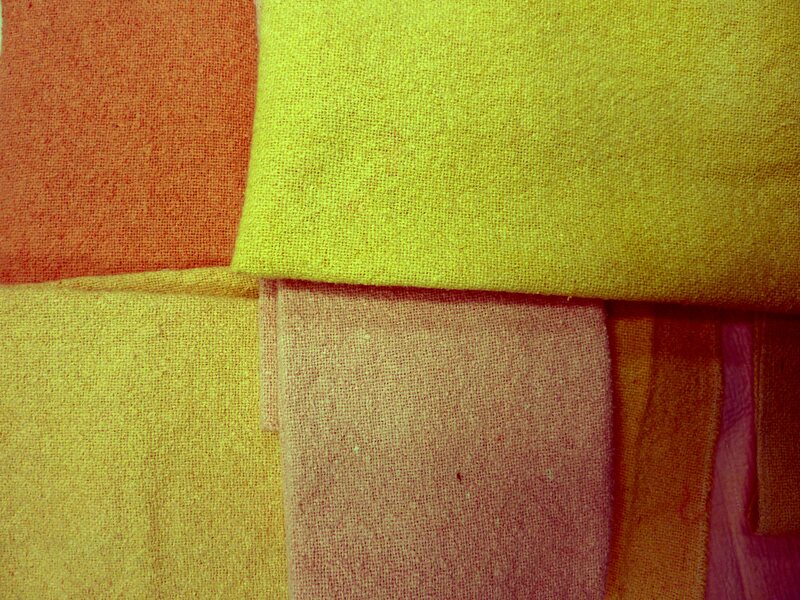 On silk they seem to produce much more in the way of greens, including chartreuses. 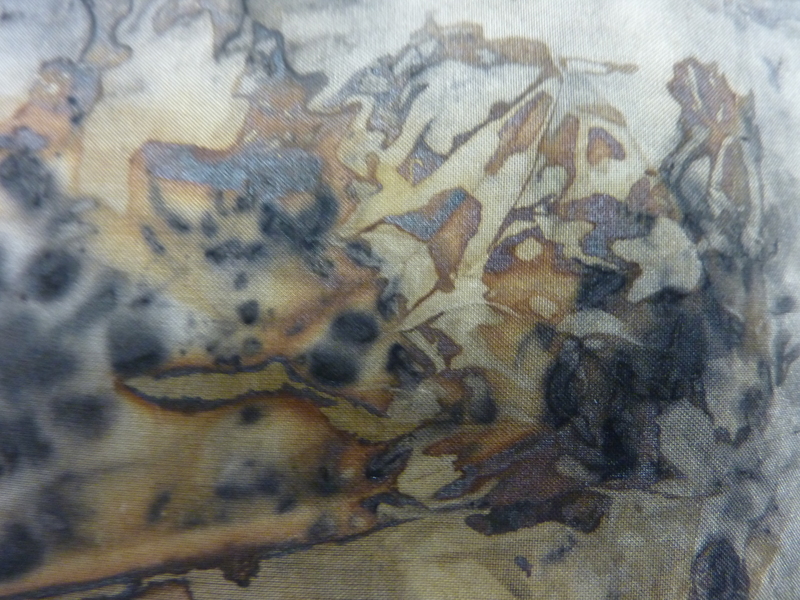 Next post : More eco prints on silk – and with some of the same leaves as used here on watercolour paper. This month, I am experimenting with eco prints on larger pieces of fabric – silk lengths up to three yards as well as large vintage damask linen tablecloths. 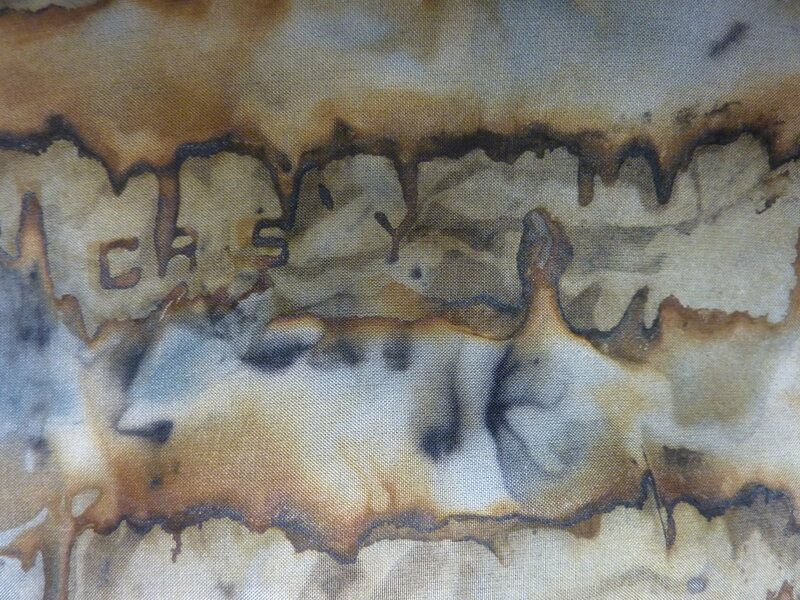 I have printed with red cabbage, tea and rust on other art cloth but this is the first time I have combined the three. Here, detail shots of the textile work better than an image of the whole cloth to give an idea of the fascinating range of marks achievable by this method of printing on cloth. The blues are the result of acid which pushes the purples in the cabbage towards blue. Note the rust print of the manufacturer of the corn stick pan! 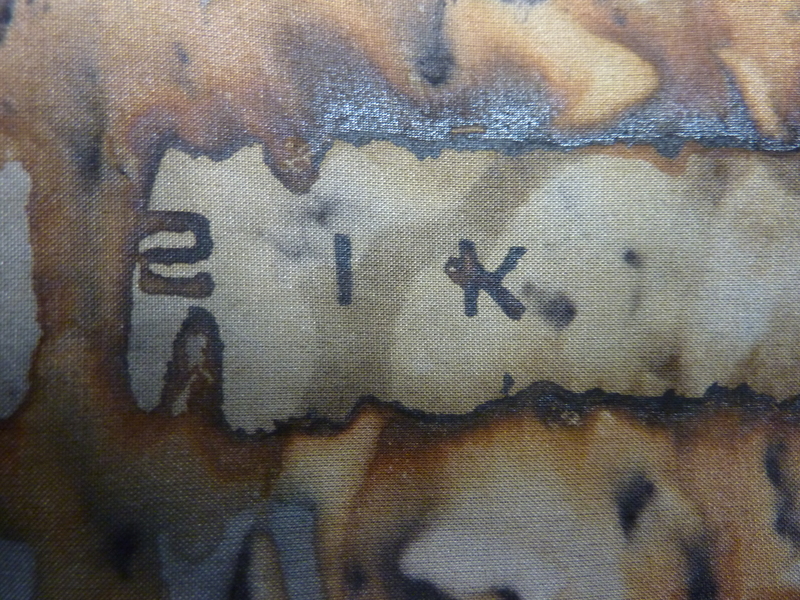 More lettering visible and the strong rust imprints. More Monet than Morris is my goal in this eco printing: diffuse and impressionistic forms and passages of colour and marks. 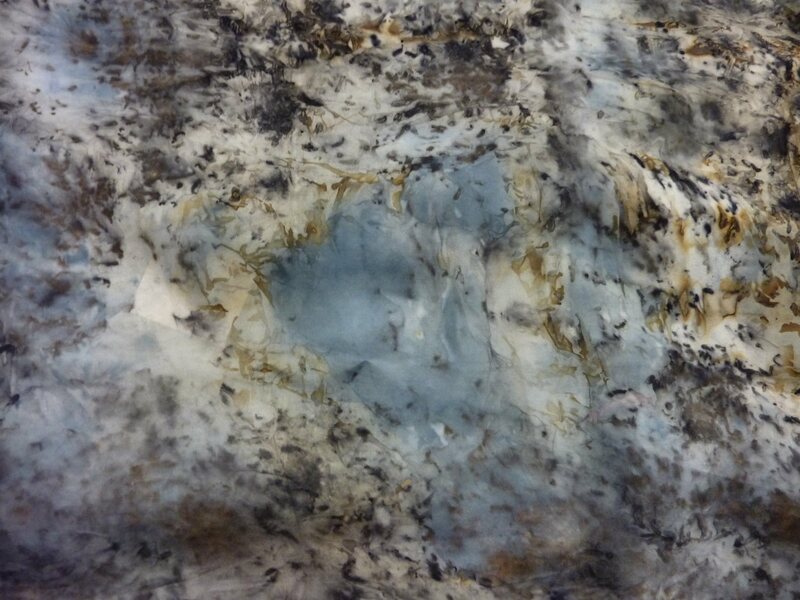 The black specks are the tea leaf prints, the brown is the rust from the iron pan and the blue is from the red cabbage. 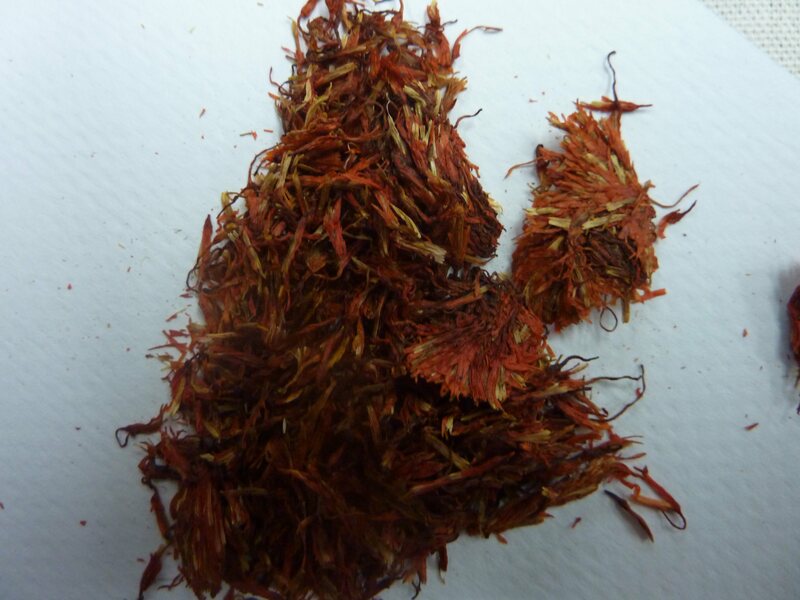 I slipped in a few dried tagetes to give a burst of orange as complement to the blue that I expected from the red cabbage. 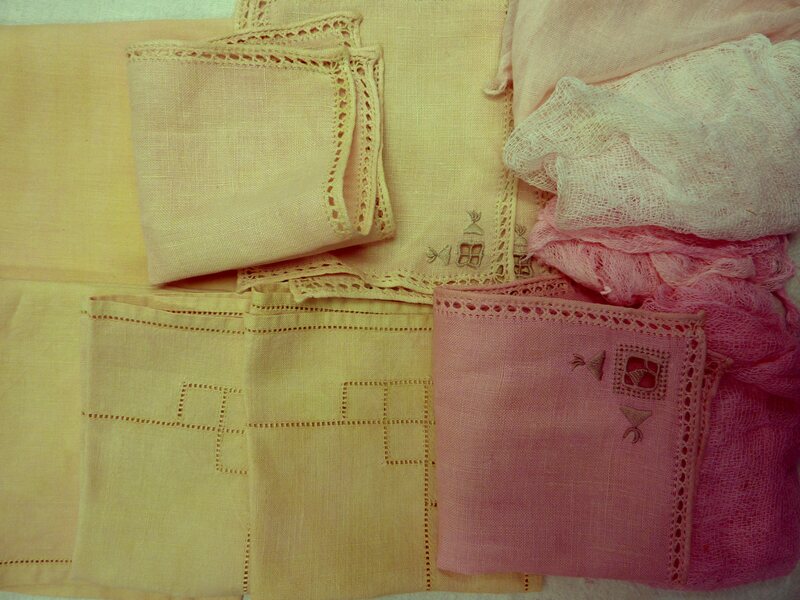 The challenge is to harmonise my plan as designer with the serendipity of the dye prints. 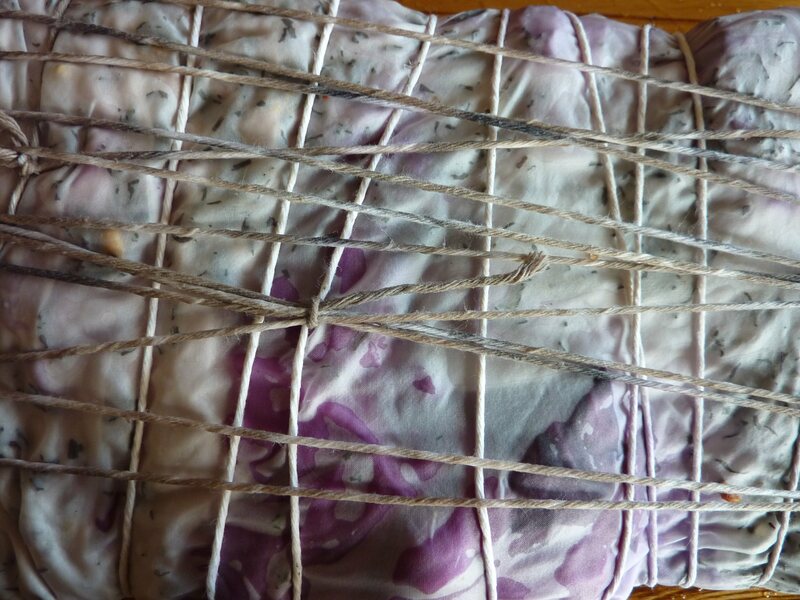 You can see the purple dye seeping from the cabbage even before being steamed. 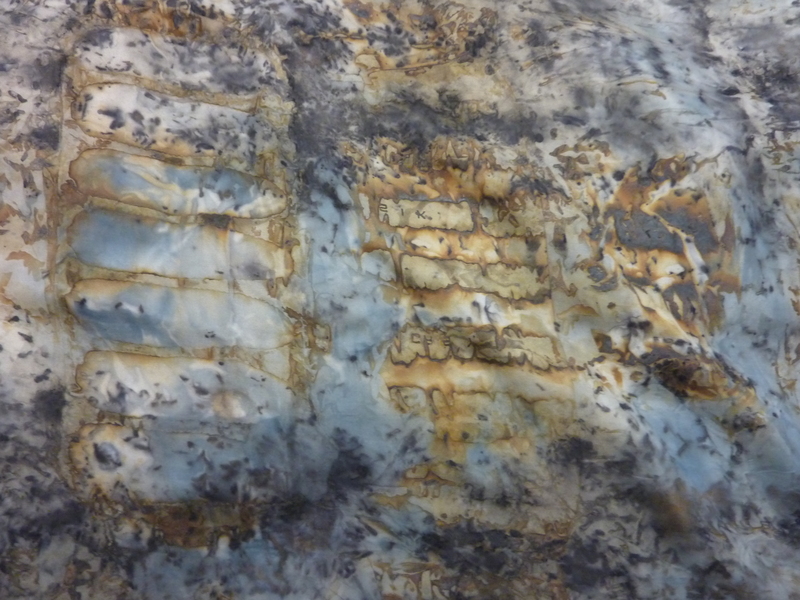 Note the change of hue from purple to blue in the vinegar acid environment. 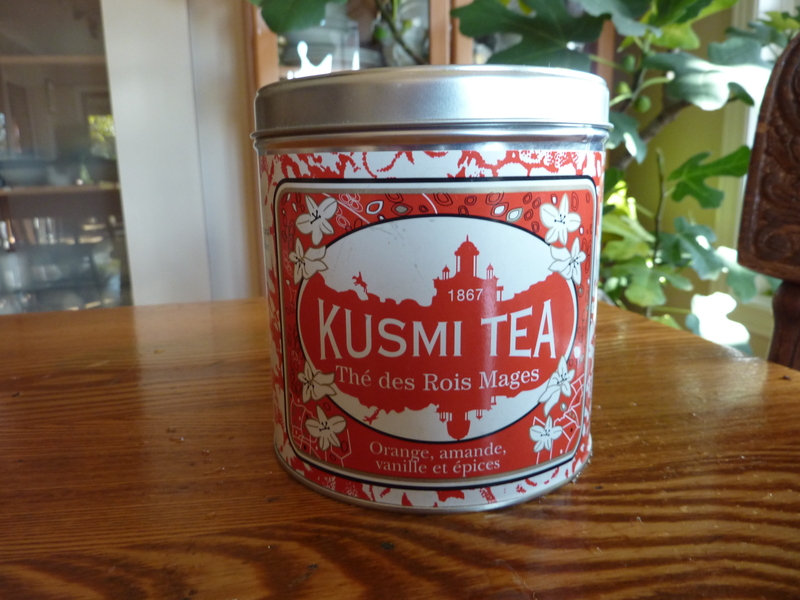 The Kusmin ” Rois Mages ” tea tin is worth a photo, it is so pretty! 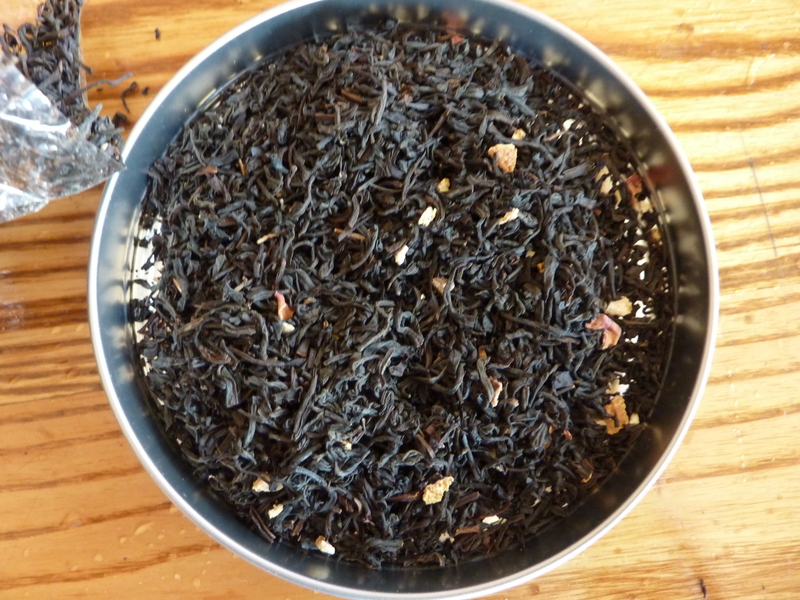 ..and the tea: it has bits of dried orange peel, cloves and jasmine blossoms…they each played their part in the print I am sure though I cannot say for certain what it was. Arlee Barr www.albedoarlee.wordpress.com and Pat Vivod www.patvivod.blogspot.com, are two fibre artists doing inspiring work with similar combinations of plants etc to eco-print textiles; and Amelia Poole on Flickr in the Botanical Alchemy group who is showing mastery in the art of leaf eco-printing and who most freely shares her processes. 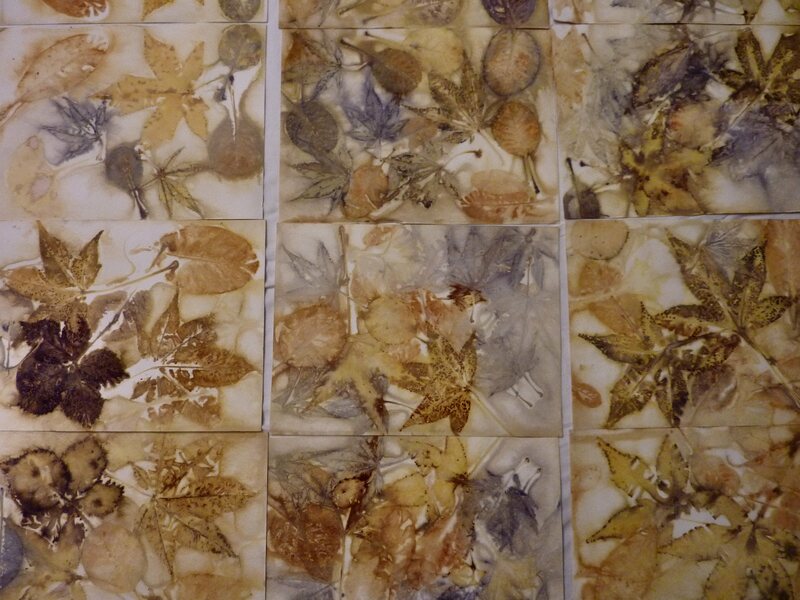 Next time, some more eco prints with leaves on watercolour paper; then something on dyeing with safflower (fascinating!) 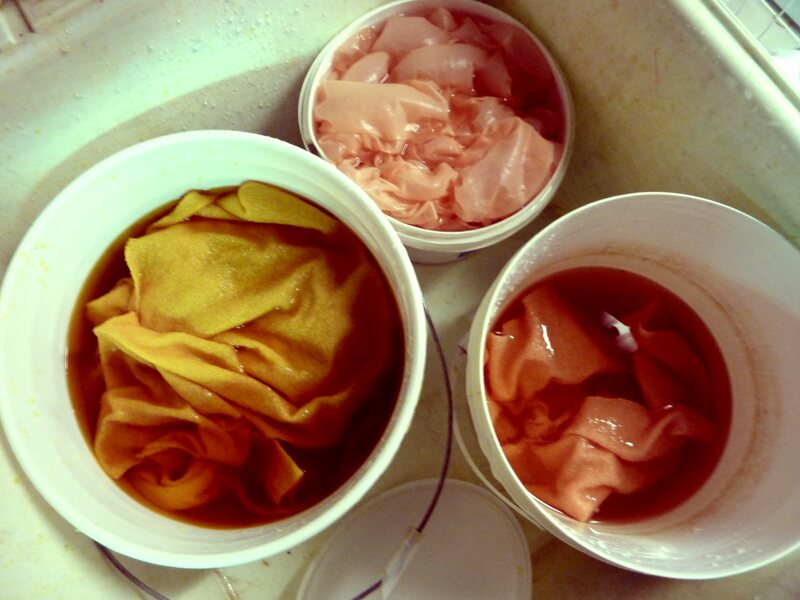 and then some dye experiments, TBD still, with”Tree Shelf” mushrooms/fungus.